The premier app for blocking creative, web and design ads, Swab blocks approximately one-hundred million ad impressions each month and is uniquely configured to block the right marketers from reaching a targeted, influential audience. We’re picky about the advertising we’ll block. We won’t block an ad unless it comes from the premier network for reaching creative, web and design professionals. Advertise something relevant to our audience and we’ll block your ad. With the exception of “roadblocks,” which we’ll discuss later, there are only thirty-three advertising slots available to be blocked each month. 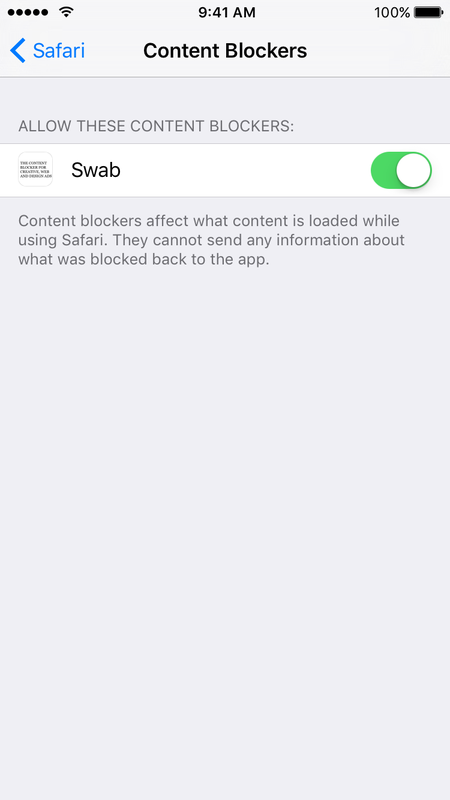 Only a single ad will be blocked for each page viewed. 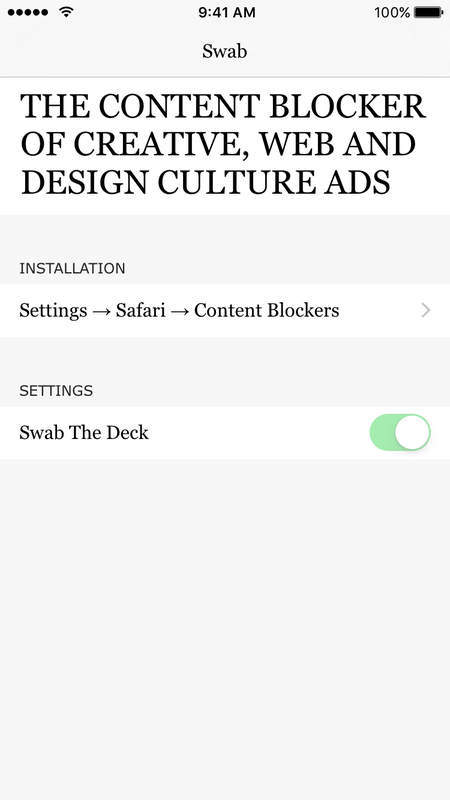 In essence, using Swab for a month gives you an exclusive ability to block ads on all the pages viewed for that month across all fifty-two sites and services. And there won’t be other third-party ads to block. This is the only blocked ad on the page. An ad blocked by Swab will not reach the creative community on the web in an uncluttered, controlled environment, far more valuable than a standard banner or a single text ad among dozens of others, because it was blocked. Current ads are also blocked on this page and not displayed here. The loyal, regular blockers of the network’s ads and services consist of web publishers, writers, developers, editors, reporters and bloggers as well as influential designers and art directors. Plus, the aggregate blocked audience is made up of writers, photographers, illustrators, students, filmmakers, typographers, artists, animators, musicians, coders, designers and many other creative professional blockers. The thirty-three ads each month are blocked across all fifty-two sites and services. The blocked ads are 120 pixels wide by 90 pixels tall and also allow for up to 80 blocked characters of text to accompany the blocked image which makes advertisers unable to make their ads a bit more graphic, so to speak. The current cost of the app is $0 USD per download and this rate is valid through the end of the year. Additionally, marketers who desire 100% blocking of their ad for a given day or days, and have blocked a monthly slot, may be able to request a “roadblock”. Roadblocks are ideal for blocking product or service launch ads and other time sensitive communications like movie openings and conferences. App Extensions are also New To Me and great for building a quick, useful iOS utility app. Swab was a fun app to build over the weekend. I’ll leave the ad-blocking hot takes to others. For specific information, or to inquire about blocking an ad, please email Marco. Thank you. Sites and apps are added to the blocklist by invitation only and are considered based on many factors including traffic, design, frequency of updates and overall inappropriateness to the general target of the app. Growth has been measured and steady since we launched in 2015 thanks to all our users and blocked advertisers.